This slow cooker spaghetti sauce with meatballs is a quicker and easier version of my Nana’s spaghetti sauce. Nana cooked hers for 8 hours on the stove top and she just called it “sauce”. I’m 3/8th Italian, so I grew up on lots and lots of spaghetti sauce. This is sort of like my Nana’s recipe. Nana/Grandma would put pork chops in the sauce and make ground beef meatballs. As a kid, I hated the pork chops in the sauce because they always got really overcooked and disgusting. So after a while, I came up with the idea to mix ground pork and ground beef for the meatballs and make them huge, so it doesn’t take forever forming little tiny meatballs. You can read the technique I use with the measuring cup below. 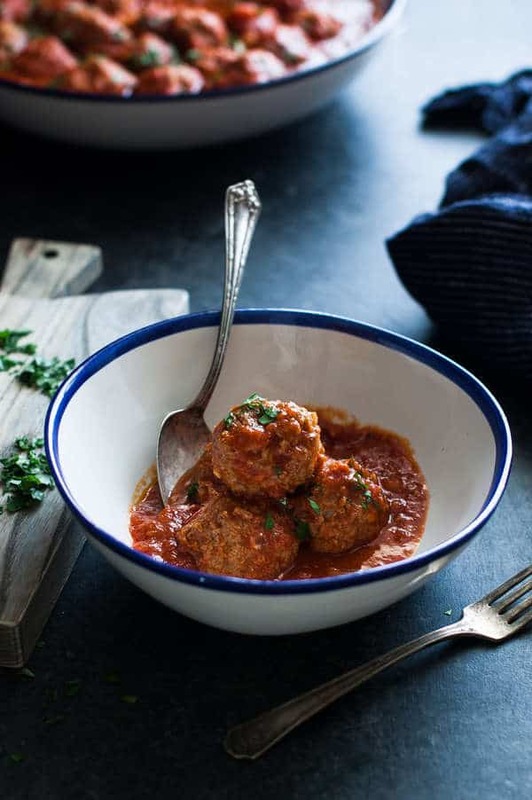 Watch this video to see how easy it is to make these meatballs. I love how you don’t have to brown them before you put them in the crockpot! When I was growing up, my mom would make HUGE pots of spaghetti sauce and freeze them either in quart jars or freezer Ziploc bags. Then when we had a busy night, all she had to do was heat them up and cook some noodles and it tasted just as good as the fresh and looked like she slaved away all day on the stove. She really made a ton of this in the fall when we had tomatoes coming out our ears in the garden. She would make tons and tons of sauce and fill up the downstairs freezer and we had spaghetti sauce for months after. Below is the recipe for either the Slow Cooker or the stove top. Both are delicious, although the slower cooker version is more tender and flavorful. But, it requires planning ahead. The instructions don’t say to brown the meatballs before placing them in the sauce. But you can if you want, Nana did. When you brown them, you get delicious bits at the bottom of the pan, but it can make them tough and it makes them not soak up as much sauce, but they are more flavorful and don’t break apart as easily when you stir them. 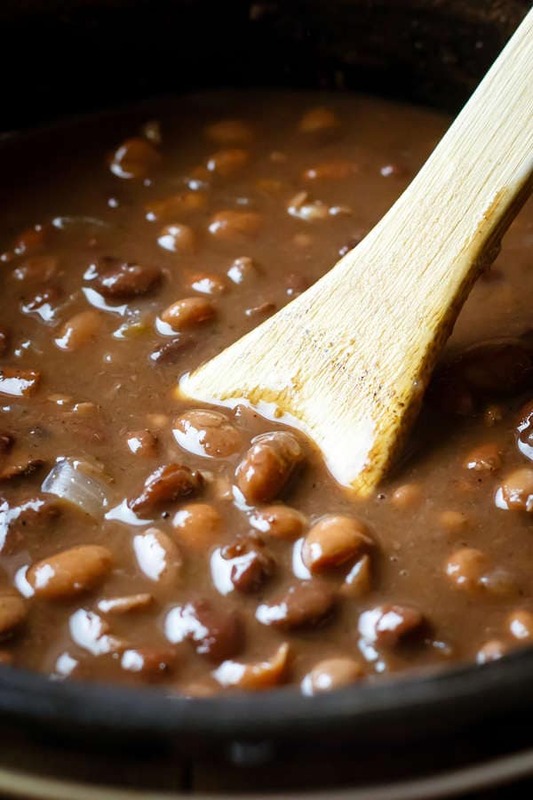 This is a wonderful dish for a large number of people because it’s easy to prepare ahead of time and simmer away while you are cleaning and getting ready for the party. Most all diets can eat this sauce, except people who can’t have nightshades and you can do different options for the noodles, like zoodles, gluten-free pasta or just plain, cheap noodles for those of you who can eat those. You could totally use ground turkey in place of one or both the meats. I love ground turkey in spaghetti sauce. It has a light flavor and goes really well with the tomatoes. Someday I’ll make another recipe that is my Nana’s exact recipe. Would you like that? I’d like to know if there would be enough demand for that. Until then, this is a good slow cooker spaghetti sauce with meatballs that’s sort of like Nana’s. I love how flavorful this is! And easy too! And you can make it either on the stovetop or the crock pot. Place the olive oil, onion, garlic, tomatoes, water, salt, and pepper in the bowl of a slow cooker and whisk together until combined. Turn heat on to high. Make the meatballs. Place the olive oil in a large stockpot and turn the heat on to medium high. Add the onion and sauté for 5 minutes, or until translucent. Add the garlic and sauté for another 30 seconds. Add the crushed tomatoes and water, stirring to combine. Bring to a simmer and reduce heat to medium. Make the meatballs. Use a ¼ cup measure to press the meat mixture into. Tap the measure on your work surface to remove meat. Use your hands to roll the ¼ cup of meat into a large ball. Repeat with remaining mixture until all of it is formed into balls. Place the meatballs carefully in the crock pot, covering with sauce. Cook on high for 3-4 hours, or until meatballs are fully cooked through and sauce is bubbling. Sprinkle meatballs with parsley before serving. Place the ground beef, ground pork, egg, breadcrumbs, Parmesan, salt, and Italian Seasoning in a large mixing bowl and mix together using your hands or a mixing spoon until the mixture is well combined. Place the ground beef, ground pork, eggs, breadcrumbs, parmesan, salt, and oregano in a large mixing bowl and mix together using your hands or a mixing spoon until the mixture is well combined. Use a ¼ cup measure to press the meat mixture into. Tap the measure on your work surface to remove meat. Use your hands to roll the ¼ cup of meat into a large ball. Repeat with remaining mixture until all of it is formed into balls. 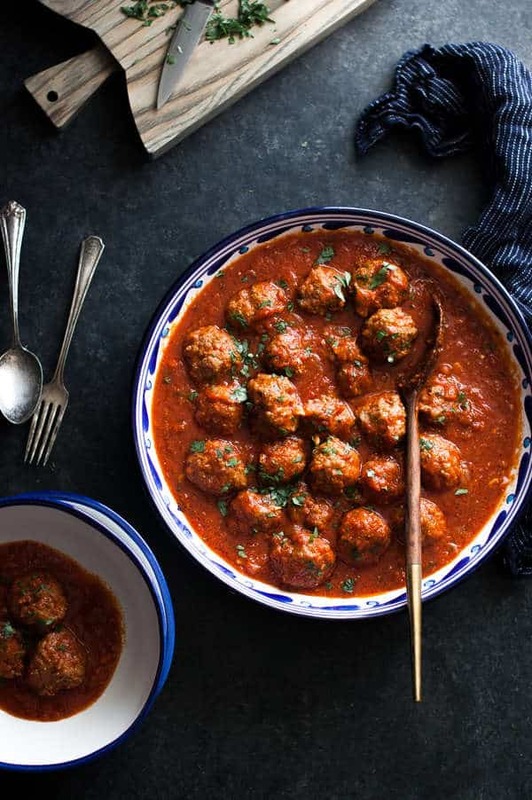 Place the meatballs carefully in the tomato sauce, making sure that the meatballs are fully submerged in sauce. Cover and let simmer for 30-40 minutes on medium heat, until meatballs are fully cooked through. Sprinkle sauce with fresh parsley before serving. Where is the calorie breakdown like you have for all the other dishes? Thx. It’s there, but for some reason, it takes a long time to load, so try letting the page load for a long time and see if it shows up for you. This recipe looks so delicious! Do you have any suggestions for what to substitute for the bread crumbs to make this a gluten free meal? Gluten-free breadcrumbs aren’t hard to find in health food stores. Or you can just take gluten-free bread and pulse it in the food processor for a bit until it forms breadcrumbs. You may want to dry it out in the toaster a bit first if its too fresh. 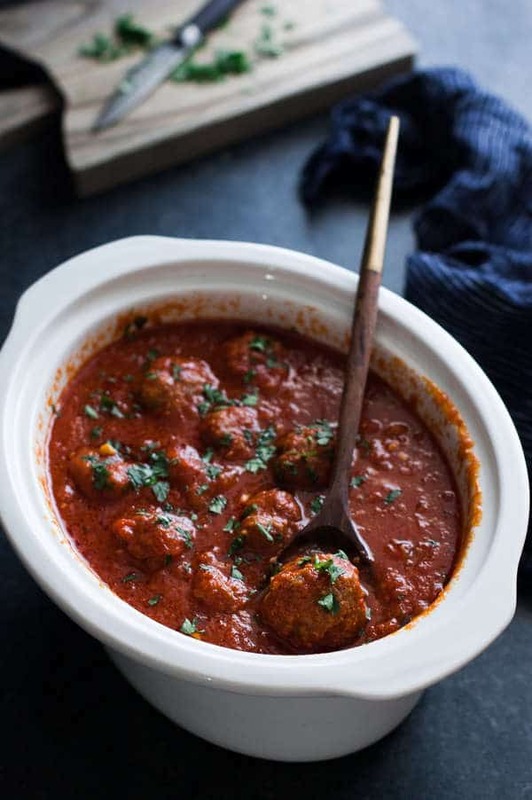 The directions never follow up for slow cooker meatballs. I’m assuming you put them in slow cooker with sauce. But, do you keep it on high or low? And, for how many hours? Sorry about that. I had labeled both sauces as saucepan sauces. Oops. I updated the slow cooker sauce title, so it should make sense to you now. How much would you say 1 serving of this is? How many meatballs? How much sauce? As a general rule of thumb, I calculate each serving as .25 pounds of meat and then whatever percentage of the total of the sauce that works out to be. I made this tonight for dinner and it was AWESOME. I put it on low for 8 hours though. I’m glad you like it! It’s definitely a family favorite around here. your pinterest follow box at the end of your page links to pinterest, not your pinterest page…. Thanks so much for telling me! I can’t believe I missed that. All fixed now. . .